The BIG football game in Utah was this past weekend. One rival is the place that gave me the education to succeed in life. The other rival is the place that currently pays for my food. Which team would you side with? Still, despite the fact that the two teams aren't in the same division and the game pretty much counts for nothing, (again, can you tell that BYU lost?) it was fun seeing the school pride being worn around both campuses this weekend. The bus I ride home from work goes from the University of Utah campus straight into the heart of BYU territory. Our bus driver recorded an announcement that we were the "Utah Fan Bus" and had it play every time we stopped. Since them's fighting words for a lot of the people riding the bus it was pretty funny watching people's reactions. Some people even hesitated about getting on. Cars driving around both schools had little school flags attached to their roofs and the whole town I live in basically shut down around game time. My husband and I watched most of the game (until the losing got too unbearable) at a sports restaurant because we don't have cable, so I didn't actually make these sticky wings to eat during the game. I did make them the next day to eat while watching a baseball game so I can still confidently say they are tested and approved as an excellent sports snack. In fact, we liked them so much that I'm not even going to bother waiting for the next sports game to make them again. You know something is great when my picky husband goes back for seconds and contemplates thirds. They're slightly sweet and slightly spicy with tender, juicy meat. The juiciness comes from slow cooking in the crockpot, and the sweet spicy flavor is enhanced with a sauce that is brushed on before broiling to give the wings great texture. No matter what side you are on in the great football rivalry in your area, (or even if you don't have a side) these wings are guaranteed to be a winner in your house. Stir 1/4 cup of the sugar, 1 T soy sauce, ginger garlic and 1/4 tsp cayenne pepper into slow cooker. Season chicken with salt and pepper, add to slow cooker and toss to coat. Cover and cook until chicken is tender, about 4 hours on low. Position oven rack 10 inches from broiler element and preheat broiler. Place wire rack in aluminum foil-lined rimmed baking sheet and spray with vegetable oil spray. Transfer chicken to prepared baking sheet and discard braising liquid in the slow cooker. Combine remaining 1/2 cup sugar, 3 T soy sauce, 1/4 tsp cayenne pepper, water and tomato paste in a medium bowl. Brush the chicken with half the mixture and broil until lightly charred and crisp, about 10-15 minutes. Flip chicken over, brush with remaining mixture and broil until lightly charred and crisp on second side, about 5-10 minutes. Serve. These look wonderful, I may have to try them out next weekend! way to stay "true blue" Nicole! :) And, yes...it was painful. I'm glad to get a great recipe out of the the embarrassment that was that game! You're totally reading my mind - I've been craving wings like mad! Totally making these soon! I think college football is so big here because there aren't many professional teams in the area. Trust me, I'd much rather be in your situation. Of course, when the professional games you do end up watching means your team is only two games up in the wildcard as of Sunday, I could pretty much go without any sports at all. Stupid Rays. Slow cooker? Yes please! Sticky Wings? Double yes! 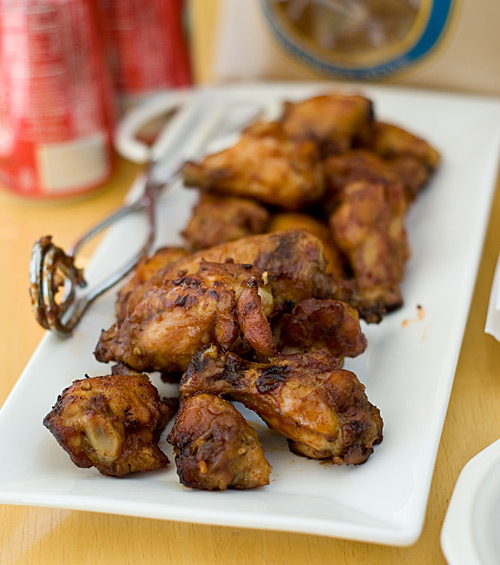 love that you used the slow cooker for the chicken wings, GENIUS. Will have to try this one for football games. So easy. 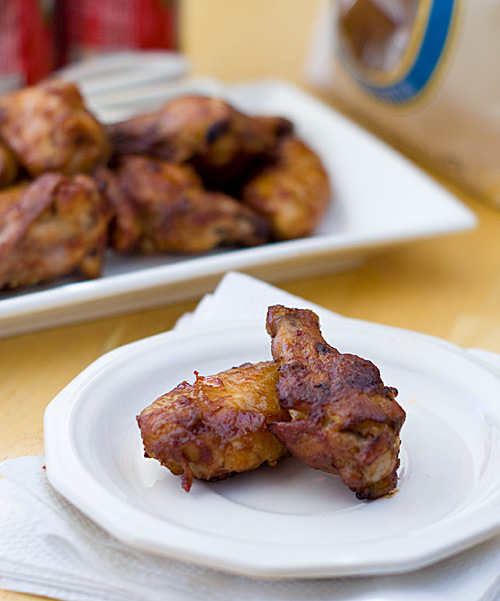 I've never made wings in the slow cooker, but I'm going to give these a try. I'm sure my husband will love them. Oh, and if I'm not mistaken, Jim McMahon is a BYU alum, too! I know I'm showing my age referncing the punky QB, but my point is you're in good company. You're right, Jim McMahon played for BYU! A lot of BYU alum don't even know that. Impressive sports knowledge, Karen. Don't be, he was a Chicago Bear that took our team to the Super Bowl during the '85 season. But I think my (Chicago) football knowledge ends right around 1990. Wow your pictures are always so fantastic. Those wings look just scrumptious! I never really got to have that college football experience because my alma mater, MIT, doesn't exactly have a football team that people tailgate or even cheer for. I love seeing other people get into it, though...and I love football food. Those wings look awesome! These both sound great, can't wait to try them!!!! !Here is the recipe for the Hot stuff honey cheese dip. Mix all together put in fridge 4- 6 hours or overnite.The more it sits the better it is. To serve put in a bowl or make a ball and out on a plate, I served it with Ritz crackers! Nicole, I'm hosting a blog hop for tailgating recipes throughout football season. Visit my blog if you'd like to join. These would be perfect! I've been following it and it's so great! Thanks for reminding me to link up. I didn't read the fine print about the rice linkup and submitted a recipe that wasn't from this month and got a reprimanding from one of the other linkers. That's why I've been wary of doing a linkup again. :) My fault for not reading carefully enough, though. Hahahahaha... don't you love a good blog reprimand? ;-) My football tailgating bloghop is come one, come all... no matter when it was posted, I'm game! Thanks for linking up. Email me offline if you want the code for any future posts... that way you can link the full gallery at the end of you post!